Why is epistemology done from a phenomenological point of view? I'm currently in a class where we are studying, among other things, the philosophy of perception. The papers we have read so far, for example Grice's "The Causal Theory of Perception" and Strawson's "Perception and it's Objects," emphasize a very subjective, observer centered theory of perception. The viewpoint I am talking about can be seen in this article: http://plato.stanford.edu/entries/perception-problem/ . It seems strange to me that in all of the analyses of perception I have read so far, the physical, scientific point of view is completely ignored. For example, if someone asked me what it meant to see a table, I would say that perceiving the table means that light reflects off the table and hits light receptors in the retina, activating certain parts of the brain. A neuroscientist or biologist could of course make this story much more precise. Now, of course science does not have all the details figured out, but it seems to me that the physical of theory of perception that science provides is clearly superior to say, a vague "sense data" theory of perception. All of the problems in the above SEP article seem to disappear if we just accept the biological story of perception. My question is, then, why is there such a separation between science and the philosophy of perception? A lot of the notions described in the SEP article, like openness to the world, seem, frankly, quaint and archaic. Why do people not accept the scientific analysis of perception as obviously superior? It's not clear how much you've read, but consider that you reading a small handful of papers doesn't exactly give you a good perspective on the field. I studied both perception in philosophy as well as perception in psychology, and in my readings (philosophy was after the psych course), I do not recall the philosopher's theories conflicting with the science I had learned prior to any great extent. In fact in most cases it wouldn't have mattered at all what the science was. Whether rods or cones are stimulated, for example, or what kind of action potential is fired when light is detected in the retina, is largely irrelevant to philosophers because they are looking at a higher level abstraction of perception. The most fundamental thought experiments of perception demonstrate very quickly why the scientific position is of little use to philosophy. But how do you know that your perception of the table is actually based off the real world and not some evil demon tricking your mind? How do you know that you simply aren't in a really vivid dream? How do you know that you aren't hallucinating? These basic questions show how scientific explanations are unreliable and give us no certainty. Most philosophers ignore them not because they have historically known little about the eye, but because that kind of data can't take them beyond the classic problems outlined above. The awareness or apprehension of things by sight, hearing, touch, smell and taste. Therefore, every single thing in our world, even science is based on common perceptions. For example, in chemistry, the states/properties/smell/etc.. of substances are universally agreed upon based on common perceptions. perception seems intuitively to be openness to the world, but this fact of openness is threatened by reflection on illusions and hallucinations. Therefore perception, as we ordinarily understand it, seems to be impossible. So, I can see why you would think that the scientific analysis is "clearly" superior. However, please take close note to what I will present to you. Is a magician affecting anyone's perception of the object? Are the properties of the given item common/normal? Is this anything that is out of the ordinary? The second choice instantly becomes obsolete; the existence of such a magician must first be proved creating an unreasonable burden of proof. Does the apple possess any properties that defy the laws of logic and physics (known to man so far)? For example, is it floating? If none of the conditions are met, then most likely, everyone will agree with you, because what you perceive is most likely not an error. Therefore, it will be agreed amongst all of you that you are perceiving a bright, red apple. Therefore, the problem of perception can (to some extent) be prevented. [A] method of analysis which sees the world as objects, sets of objects, and objects acting and reacting upon one another. 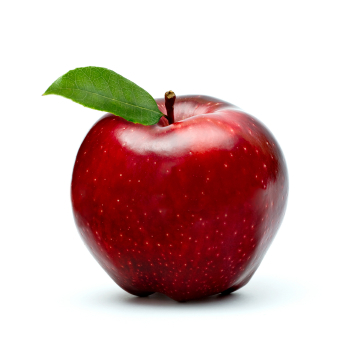 The structure of the problem is simple: why try to scientifically prove that the apple is red when all of us agree on it? The apple is red, and there is not much else to it. Why go to great lengths to try to scientifically prove something whose existence we are almost certain of? Perhaps why perception is preferred over scientific analysis therefore, is simply because it's not unnecessarily complex, and is (for the lack of a better word) therefore, much simpler. Philosophers need not waste their time pondering about simple things. Such paranoia would be as pointless as much as it would be illogical. Well, I dug up my copy of Descartes' Meditations, and I'll try to provide a supplementary (but not substitute) answer in support of the others here. For reference, mine is translated by Donald Cress. I realized that once in my life I had to raze everything to the ground and begin again from the original foundations, if I wanted to establish anything firm and lasting in the sciences. This position is very significant in the sciences to this day. As children, we are full of misconceptions about the world, and it is the job of proper sciences to come and raze to the ground all of the false beliefs that we hold (sometimes, it even builds up false beliefs for simplification, only to replace them with the proper models later - lift, anyone?). From our perceptions, many of these misconceptions arise. As my physics teach once said, "common sense is the prejudice of experience." Thus, Descartes observes the "problem of perception." How can we (why would we?) begin to use scientific models in philosophy, when as stoicfury said, "scientific explanations are unreliable and give us no certainty." So, as Descartes noted, epistemology in philosophy requires us to apply to ourselves a "general demolition of [our] opinions" which have been established by perception. To use what we observe scientifically for philosophy is to accept the problem of perception. Surely whatever I had admitted until now as most true I received either from the senses or through the sense. However, I have noticed that the senses are sometimes deceptive; and it is a mark of prudence never to place our complete trust in those who have deceive us even once. Descartes even questions how we can know that we are not dreaming. Admittedly, this is an extreme of solipsism, but still an important point on how unreliable perception is. Physics, astronomy, medicine, and all the other disciplines that are dependent upon the consideration of composite things are doubtful, and, on the other hand, arithmetic, geometry, and other such disciplines, which treat of nothing but the simplest and most general things and which are indifferent as to whether these things do or do not in fact exist, contain something certain and indubitable. For whether I am awake or asleep, two plus three make five, and a square does not have more than four sides. This is why science is simply not a question in epistemology; philosophy has its own method for epistemology, and science goes about its experiments in tangent. Again to reference stoicfury's answer, it isn't that philosophy disagrees with science, but that, as Descartes said above, philosophy does not trust scientific results for use in epistemology. Philosophy just sticks to internal thought to avoid the problem of perception. I hope this answer helps and provides you with one (very influential) philosopher's relevant opinion. Not the answer you're looking for? Browse other questions tagged epistemology philosophy-of-science or ask your own question. Why was Socratic epistemology diminished? Per Kuhn's “puzzle solving” demarcation criteria, don't Creationism and Lysenkoism simply fall into the category of “normal science”? From the point of view of philosophy of science, what is abduction? Can shared-subjective knowledge be part of science? Is there anything left in contemporary epistemology and science from the German Idealism?